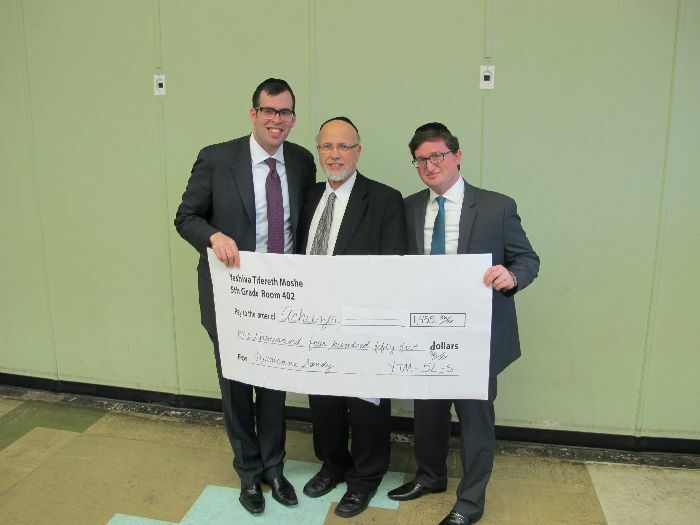 Yeshiva Tifereth Moshe's 5th grade students welcomed the Achiezer organization to their school, located in Kew Gardens on Thursday afternoon. One by one the students took the stage to read letters which they had written in the previous weeks to comfort those affected by Hurricane Sandy's devastation. Most students described how they banded together as a class to raise money for the Far Rockaway, Bayswater, and Five Towns community by organizing fairs, drives and sales to supply much needed funds for Achiezer's relief efforts. Following each speech, every letter was presented to Rabbi Boruch Ber Bender on behalf of Achiezer to be shared with the community and in particular 5th grade students themselves. In closing, Rabbi Bender spoke to the children about how what they have done is a tremendous chizuk to everyone back on the "home front" and he imparted the boys with a message to give a call to any fellow boy's they knew in the affected areas to offer words of encouragement and friendship. Most importantly, the impressive chesed of the students and faculty at Yeshiva Tifereth Moshe left Achiezer and our community with a beautiful impression of support which will enable them to continue with the still ongoing recovery effort!